Reach cat owner enlightenment with this set of yin-yang drinking glasses. Cat lovers will reach owner-enlightenment with these four-sided glasses featuring yin and yang images exploring feline duality. Corresponding cat wisdom floats near each good and bad kitty portrait, while the secret of true harmony: "The Tao of Cat is to do your thing and leave the kitty alone" runs along the side of each glass. "To obey is to resist"
"To shun is to adore"
"In catnip there is dignity"
Glassware made in New Jersey, decorated in Minnesota. Sold as a set of four. . Please click here to download our free Printable Cat Tao Birthday Cards! We chatted with Patricia about how she brings her charming illustrations to life (and got a look at her adorable studio cat). Read the Q&A on our blog. Patricia Carlin believes that a small sketch has the power to tell a story without language. She started out as an art director in Philadelphia, selling everything from potato chips to financial products. In 2001, a friend wanted help launching a glassware business, so Patricia designed and wrote copy for several products for the new venture. Patricia has explored many techniques in her illustration, but simple line drawing appeals to her most. "For me, paring things down to their simplest essence is always the best way to understand them," she says. I got these as a housewarming gift for friends (who own a cat) - they LOVE them! was looking for informal, humorous glasses. These are perfect. I use them every day. Bought as a birthday gift for a friend and she loved them! 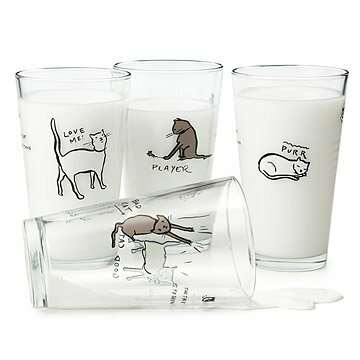 Quality glasses--the glass is thick, design is great for cat lovers. Fast shipping, too!! Purchased these tumblers for myself as a birthday gift- was planning a small gathering of friends & thought these would be great fun. They certainly were! My daughter was very pleased with the gift. She liked the design and quality. I got this for my partner who adores cats. When he opened the package he read all of the sayings on the cups and giggled a few times when reading them. These are now the only cups he uses for cold drinks.